An image crying out for words..
After a serious discussion about word and image yesterday, its time for a little light relief. For various reasons we have been acquiring a set of Ladybird books at home, and yesterday a few more were added to the collection. In many ways the books were the Dorling Kindersly of their day. Text and illustrations were often of the highest calibre and held a charm for adults and children alike. However, the illustration below, from Jesus by the Sea of Galilee, maybe leaves something to be desired. 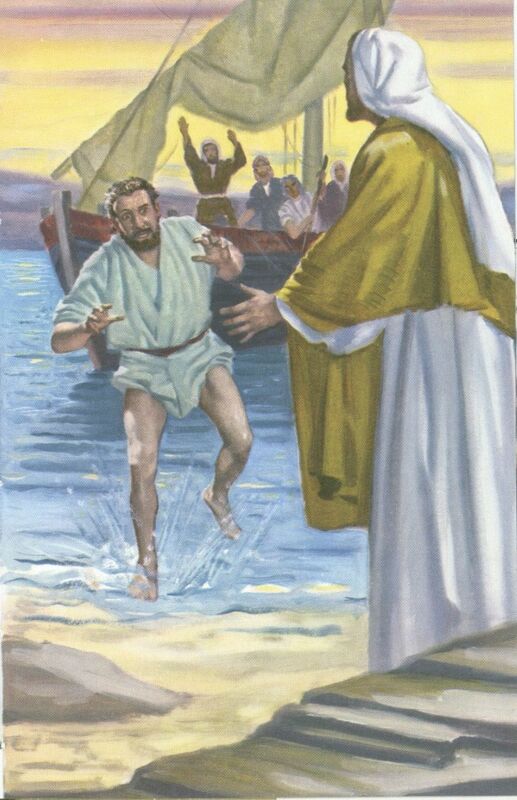 It shows Peter coming ashore to Jesus with a very startled expression on his face! Would anyone care to suggest a caption, via comments? I’d love to insert a caption about flashing, but the robe arrangement doesn’t allow for that! You never told me the water was HOT! Fair point – although in fairness I think the fun is directed purely at the image itself, and not at the actual people in what the real story.